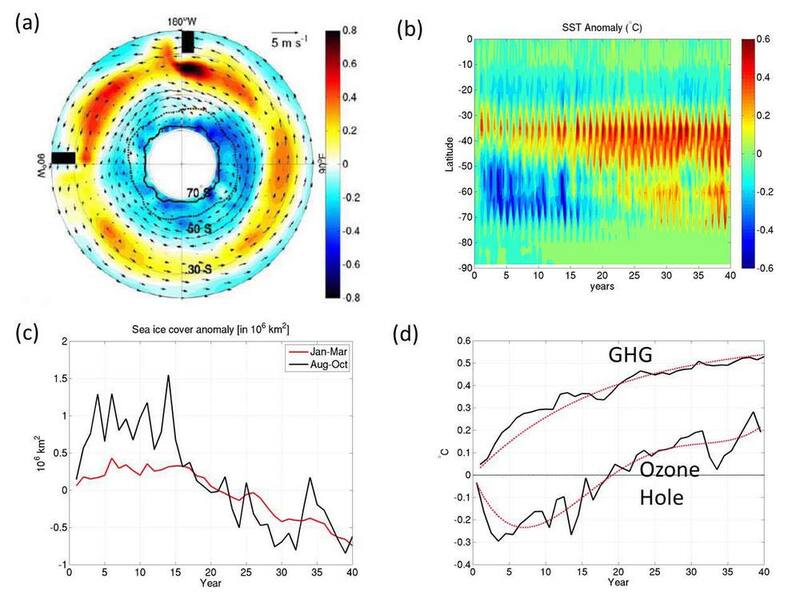 What are the climate impacts of stratospheric ozone depletion and recovery over the Antarctic? What are the indicators and mechanisms of these impacts within this atmosphere-ocean-ice-carbon system? Our effort to answer these questions is organized around the three themes below. How does interactive chemistry modify coupling between the stratospheric vortex and the rest of the climate system? Trends between 2000 and 2050 in the zonal-mean zonal wind (top) and sea level pressure (bottom). Left panels show results from interactive stratospheric chemistry control simulations. right panels show response for prescribed zonal-mean ozone simulations. (from Waugh, 2009). How are ocean circulation, ice cover, heat and carbon uptake and biogeochemistry impacted by the ozone hole? (a) Ensemble-mean SST and wind anomalies induced by a green's function ozone hole forcing (see Ferreira et al., 2010). (b) Monthly and zonally averaged SST anomalies over 40 years following imposition of ozone hole from (a). (c) green's function response of winter (Sept) and summer (Jan) sea ice extent. (d) Green's function SST response (averaged between 50 and 70 degrees south latitude) plotted with green's function for GHGs. How does the ozone hole impact global climate and what are the observable indicators? Schematic (left) of the impact of stratospheric ozone loss on the southern hemispheric climate system. blue arrows show changes in location and extent of atmospheric circulation, precipitation and sea ice. Black arrows show changes in ocean circulation due to increased westerly winds. temperature, salinity and ventilation are on density surfaces (thing curves). table on right shows climate system changes linked to ozone depletion, with references.